For the girl who has everything ! Another pair of shoes or a handbag will always put a smile on her face. 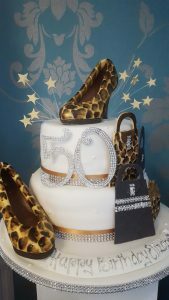 So how about a cake with shoes made out of the finest Belgium chocolate!. In a bright red or bring out the animal in her and order animal print! always a winner. We did it!! Elaines Creative Cakes won wedding cake designer 2017. Elaine’s Creative Cakes won The Wedding Awards Wedding Cake Designer 2017 category. The finalists were from the midlands upwards, several were from Manchester, but Elaine’s Creative Cakes in Davyhulme and Urmston won the award; beating off stiff competition from our competitors but prevailing as the North West and Midlands wedding cake designers of the year 2017. For more information about our fantastic range of wedding cakes, why not check out our wedding cake gallery which is here or contact Elaines Creative Cakes for more bespoke requests, we aim to cater for your every whim.